Every so often new music falls into our hands that we’re so blown away by we just have to share. Such is the case with Colin Waterson, the Glasgow born, blue-eyed soul singer whose debut album Dada is pure electro-heaven. 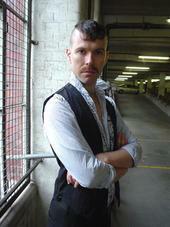 Think Annie Lennox or Billie Ray Martin’s younger brother. Think Boy George and Alison Goldfrapp’s love child. The album is dramatic, both high BPMs and low. First single “Fa Fa Feel,” reminiscent of Goldfrapp, bounces along while his filtered vocals slowly build. On “Cool Connection” he sings “walk down the street, feel the heat, I’m electric.” Indeed he is. You’ll want to dance. Trust us. He’s part disco belter and part glam rocker. He’s also a torch singer. Although the upbeat, electro-pop gems on Dada are near perfect, it’s the slower parts of the record that truly show Waterson’s vocal prowess. Sad love songs are a dime a dozen, but they rarely sound this freaking cool. “Every Shade of Wrong” and “Can’t Go Back Again” are slow, moody, and complete with heartbreaking lyrics. You can hear the hurt in his voice and it’s a wonderful contrast to the over-produced pop and soulless dance music we gays consume in mass amounts. Very rarely does an artist’s style equally match his substance. Waterson’s accomplished just that. Dada delivers musically, lyrically, stylistically, and vocally. He looks goods and sounds even better. The album is now available in the US via iTunes. If you buy it, we’ll forgive you when you grab Paris Hilton’s album next month. Well, maybe we will. This album really is AMAZING! This is exactly the kind of artist we need! His lyrics are what really appeal to me (apart from his wonderful voice and fantastically original music that is) like on ‘No Ism’ – when he says “…I’m all man, I love women. I love men, I’m a woman…” I mean that’s, like, incredible to me!!! And it doesn’t end there. There are so many little gems of sentences on this album. When he’s coming to NY to perform? I’d LOVE to see him live! This is too cool! So much so that I’ve named myself just that! Bowie meets Grace Jones. Madonna meets Donny Hatthaway. Little Jimmy Scott meets Kraftwerk and Daft Punk! Whew! This is my favourite album so far this year. Hands down, no argument – da coolest record out so far this year!!! Thanks for turning me on! This is the best electronic soul album I’ve heard all year! Such passion and depth. no wonder people who have bought this have also bought Imogen Heap, Daft Punk, Scissor Sisters and Tiga – ‘Dada’ is so UP there with all of these artists! Brilliant!